The Apostles of Clean Fighting: Who Put the Rifle into the National Rifle Association? George Washington had his portrait painted with one. Daniel Boone created a legend with one. Abraham Lincoln liked to try them out on the White House lawn. And Teddy Roosevelt had his specially customized. Now, in this first-of-its kind book, historian Alexander Rose delivers a colorful, engrossing biography of an American icon: the rifle. Drawing on the words of foot soldiers, inventors, and presidents, based on extensive new research, and spanning from the Revolution to the present day, American Rifle is a balanced, wonderfully entertaining history of the rifle and its place in American culture. Beginning in the eighteenth century, American soldiers -- including George Washington -- discovered that they did not have to fight in Europe's time-honored way with massed, brute, highly inaccurate musketry. With the development of the famed "Kentucky Rifle" -- a weapon slow to load but devastatingly accurate in the hands of an expert -- a new kind of warfare had begun. So had the birth of the American individualist in battle. In this spirited narrative, Alexander Rose reveals the hidden connections between the rifle's development and our nation's history. We witness the high-stakes international competition to produce and procure better gunpowder . . . how the mysterious arts of metallurgy, gunsmithing, and mass production played vital roles in the creation of the American economy . . . and the ways in which bitter infighting between rival armament companies affected diplomacy and some of the most momentous political decisions in American history. And we learn how each advance in riflery and ammunition triggered debates and changes in military tactics, how tests -- frequently bizarre -- were conducted, how choices were made and specific guns impacted entire wars. 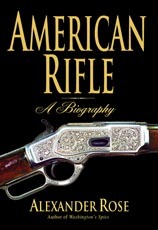 From physics to geopolitics, from frontiersmen to the birth of the influential National Rifle Association, American Rifle is a must read for history buffs, gun aficionados, soldiers -- and anyone who wants to understand the dynamic relationship between the rifle and our nation's history.